The Chair TPE traditional Pilates equipment is a fundamental tool for your Pilates studio and for your Pilates training. You will be able to carry out all the exercises and Pilates variants applied to this tool with the best comfort, safety and stability. Buy it or request information on this tool by calling us at 029522322 or by sending an email to our address info@worldpilates.it. You will receive all the useful information on the Chair TPE traditional Pilates equipment and a possible quote. Our tools are entirely designed and produced in Italy by our company. 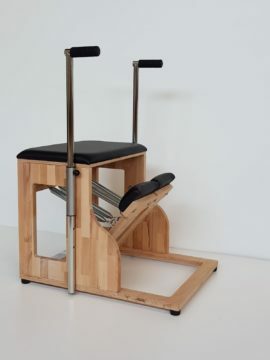 The Chair TPE traditional Pilates equipment is produced in stainless steel and laminated beech with water-based varnish. It has a great resistance that can be regulated in many different combinations. It is produced with 4 springs in galvanized harmonic steel. A particular feature that represents it is the rectangular shaped workings that make its unique design. The upper seat is upholstered in fireproof eco-leather that can be customized in color. It is very stable on the floor thanks to its non-slip rubber feet. It has two lockable and unlockable pedals with a large padded surface and covered with fireproof eco-leather. The height and distance of the handles can be adjusted quickly and easily using manual pins. We are in Cassina De ‘Pecchi (MI), via Quartiere Aurelia, 76. Here you can see and experience all our production. Before starting physical activity consult your doctor.